Yellow Armpit Stains: Is Your Deodorant Ruining Your Dress Shirts? It’s very likely that at some time or the other, you owned a dress shirt or blouse that had stains, discoloration or even tears after only a few wears. Especially in the armpit area (Hello yellow underarms!). With the warmth of the summer comes the challenge of keeping the underarms of your dress shirts or blouses dry, clean, and most importantly the same color as the rest of the shirt. So you’re probably asking yourself: what happened to my dress shirt or blouse that caused the stain or discoloration? Why can’t I raise my arms in confidence, high five people or give thumbs ups? Deodorants and anti-perspirants contain several chemicals including aluminum chloride, alcohol and fragrances. Keep in mind that these are also included in your body lotions, perfumes, hair sprays and many other hygienic products that you personally put on. Once these active ingredients, which happen to be quite acidic, connect with your sweat, they can stain, weaken and even ruin your clothes. Cotton, linen and synthetic fabrics are especially vulnerable to stains and damage from aluminum chloride. It is also important to know that a professional dry cleaner has no way of knowing that your underarm fabric is becoming weakened until the effects are visible, often after the item is cleaned. In order to prevent this type of damage you might consider changing to a deodorant that is labeled “natural”, doesn’t contain aluminum chloride and has a neutral pH. It’s also important to point out that after taking a shower, you should wait until your skin is fully dry before applying deodorant, and then allow it to completely dry before putting on your clothes. Another solution, although not as popular today as a few decades ago, is wearing an undershirt. The undershirt can effectively protect your expensive dress shirts from stains and helps prolong the lifespan of your clothes. This trick will also keep your shirt fresher all day. Besides the discoloration of your dress shirt under the arms you may also notice weakening of the fabric, sometimes even small tears. This happens when anti-perspirants have remained on the fabric for a long period of time. 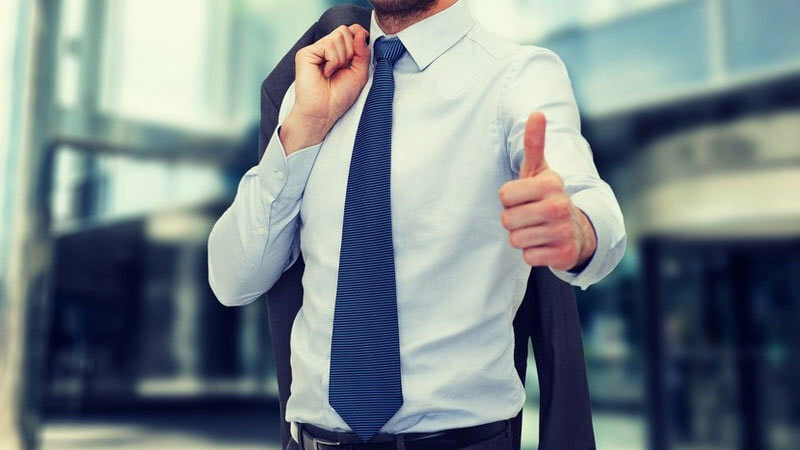 In order to prevent this type of chemical damage, make sure to wash the dress shirt as soon as possible after wearing to have the anti-perspirant removed from the garment. In the business world, armpit stains are not only embarrassing, but they’re also very distracting. How could your potential client or even your boss focus on your wonderful presentation when every time you raise your arm, a big yellow stain is staring back at them? Well, let’s look on the bright side. Mr. Timesaver has you covered. As an on-demand dry cleaning and laundry service provider, we genuinely know your clothing is important for you and also an investment of both money and time. For that reason, we’re always looking for innovative and sustainable ways to extend the lifespan of your clothing and provide you with the best customer service. Learn more about treating and preventing the “ring around the collar” stain on your dress shirts.